- Isa. 2:2, emphases added. Keep in mind that there are no nations in heaven, so this verse must be referring to all nations [as nations] coming to Christ in the future -- on a much larger scale than what happened in the past with, as one historical example, the nations that covenanted with Christ in the Solemn League and Covenant. "Now, Christians, the more great and glorious things you expect from God, as the downfall of antichrist, the conversion of the Jews, the conquest of the nations to Christ, the breaking of all yokes, the new Jerusalem's coming down from above, the extraordinary pouring out of the Spirit, and a more general union among all saints, the more holy, yea, the more eminently holy in all your ways and actings it becomes you to be." - Thomas Brooks, The Crown and Glory of Christianity, 1662, Complete Works, 1867, p. 444, as cited in Iain Murray's The Puritan Hope: Revival and the Interpretation of Prophecy, p. 84). 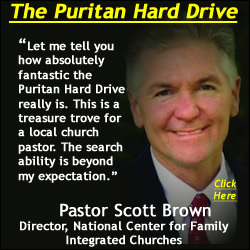 "In the history of the church's sanctification I don't believe there has been a more valuable extra-biblical resource and tool than the Puritan Hard Drive." FREE MP3s: ESCHATOLOGY OF CHRIST'S VICTORY! "Faith imbued with zeal for the honour of Christ and the glory of God will have no sympathy with the defeatism which is, after all, but disguised fatalism. He who is head over all things is head over all things to his body the Church. He has all authority in heaven and in earth. And he is the Lord of the Spirit. Implicit in the prayer he taught his disciples to pray, 'thy will be done as in heaven so in earth,' is the prayer that the whole earth should be filled with his praise. Nothing less is the measure of the believer's desire. 'And blessed be his glorious name for ever; and let the whole earth be filled with his glory' (Psalm 72:19)." - Prof. John Murray, Collected Writings, Vol. 2, p. 350 (emphases added). "There will come a time when the generality of mankind, both Jew and Gentile, shall come to Jesus Christ." "There will come a time when in this world holiness shall be more general, and more eminent, than ever it hath been since Adam fell in paradise." - Thomas Brooks, The Crown and Glory of Christianity, 1662, Complete Works, Vol. 4, p. 434 (Thomas Brooks Works are also on SWRB's Puritan Hard Drive). "...we feel disposed to regard it as something more than a baseless vision of imagination which leads us to hope that the period is not distant when the mighty principles of the Westminster Standards shall be more extensively recognised than they have ever yet been, and shall put forth an energy of influence on society hitherto unknown." - William Symington, Historical Sketch of the Westminster Assembly, pp. 42-43 (emphases added). "Prophecy shows that a time is coming when the Kingdom of Christ shall triumph over all opposition and prevail in all the world. The Romish Antichrist shall be utterly destroyed. The Jews shall be converted to Christianity. The fullness of the Gentiles shall be brought in and all mankind shall possess the knowledge of the Lord. The truth in its illuminating, regenerating and sanctifying efficacy shall be felt everywhere, so that the multitudes of all nations shall serve the Lord. Knowledge, love, holiness, and peace shall reign through the abundant outpouring of the Holy Spirit. Arts, sciences, literature, and property shall be consecrated to the advancement of the kingdom of Christ. The social institutions of men shall be regulated by gospel principles, and the nations as such shall consecrate their strength to the Lord. Oppression and tyranny shall come to an end. The nations, instead of being distracted by wars, shall be united in peace. The inhabitants of the world shall be exceedingly multiplied, and pure and undefiled religion shall exert supreme dominion over their hearts and lives so that happiness shall abound. This blessed period shall be of long duration." "They forget a main point of the Church's glory, who pray not daily for the conversion of the Jews." "The end of this world shall not be till the Jews are called, and how long after that none yet can tell." "The faithful Jews rejoiced to think of the calling of the Gentiles; and why should not we joy to think of the calling of the Jews?" "Undoubtedly, that people of the Jews shall once more be commanded to arise and shine, and their return shall be the riches of the Gentiles (Rom 11:12), and that shall be a more glorious time than ever the Church of God did yet behold." The bulk of the book consists of David Brown's classic work focusing on Romans 11, The Restoration of the Jews (1861). This is the same David Brown that had a hand in the Jamieson, Fausset and Brown (JFB) Commentary and whose "most enduring work... Christ's Second Coming: Will It Be Premillennial? ... remains the classic evangelical polemic against premillennialism" (Dictionary of Scottish Church History and Theology, p. 97). In short, this book demonstrates that Scripture teaches (and the best Reformation theologians concur) that the future will be most glorious for the Jews -- when they, as a people, are drawn by God's irresistible grace to the Lord Jesus Christ. "O to see the sight, next to Christ's coming in the clouds, the most joyful! Our elder brethren the Jews and Christ fall upon one another's necks and kiss each other." "Because of their outlook upon the future all Scottish missionary leaders took the long-term view in evangelization, that is to say, they did not regard the number of individual converts in the present as the first consideration, but rather that energy should be deployed in work which would have the maximum influence upon nations in subsequent generations." - Iain Murray, The Puritan Hope (emphases added). The full paperback edition of the The Puritan Hope: Revival and the Interpretation of Prophecy is available at Monergism Books. The first four chapters of The Puritan Hope: Revival and the Interpretation of Prophecy are free online (click here). 'You that are in hazard for the truth, be not troubled: our Lord will be exalted among the heathen. But many will say, "We know He will be exalted at the last and great day when He shall have all the wicked on His left hand." Yes but says He, "I will be exalted in the earth." He has been exalted on the earth; but the most wonderfully exalting of His works we have not yet seen. The people of God have been right high already. Oh, but the Church of the Jews was sometimes very high, and sometimes the Christian Church! In the time of Constantine she was high. Yea, the Church of Scotland has been very high, "Fair as the moon, clear as the sun; and terrible as an army with banners." The day has been when Zion was stately in Scotland. The terror of the Church of Scotland once took hold of all the kings and great men that passed by. Yea; the terror of it took hold on Popish princes; nay, on the Pope himself. But all this exalting that we have yet seen is nothing to what is to come. The Church was high, but it shall be yet much higher. "There is none like the God of Jeshurun." The Church of Christ is to be so exalted that its members shall be made to ride upon the high places of the earth. Let us not be judged to be of the opinion of some men in England called the Fifth-Monarchy men, who say that, before the great day, Christ shall come in person from heaven with all the saints and martyrs and reign a thousand years on earth. But we are of the opinion that the Church shall yet be more high and glorious, as appears from the book of Revelation, and the Church shall have more power than ever she had before.'" - Iain Murray, The Puritan Hope: Revival and the Interpretation of Prophecy (Chapter 4: Apostolic Testimony: The Basis Of The Hope), emphases added. The scope of A History of the Work of Redemption is vast. From a deep and extensive knowledge of Scripture, Jonathan Edwards sets out to survey the whole of the redemptive work of God in history, from the Fall of man to the consummation of all things. From this a thrilling conclusion emerges: Everything in human history from start to finish is subservient to Christ's work of redemption. Not only can nothing thwart that work, but, in the wisdom of God, all that comes to pass actually serves to advance it. In a series of thirty sermons preached in Northampton, New England, in 1739, Edwards sought to establish his congregation in this mighty truth. Later in his ministry he hoped to write a book expounding the same theme, and was even reluctant to accept the presidency of Princeton College for fear this project would be hindered. Although he did not live to carry out his intention, we can see the substance of what the intended book would have contained in this new edition of the sermons of 1739. Here readers can catch Jonathan Edwards' vision of the mighty advance of the cause of Christ in the world, and gain encouragement for all gospel labors from the certainty of its triumph. Dr. Reg Barrow, the President of Still Waters Revival Books, considers Jonathan Edwards' The History of Redemption one of the best Christian books ever written - of the many thousands he has read, heard, edited, compiled, published and/or studied. E4 News writes, "The Encyclopedia Britannica call Jonathan Edwards 'the greatest intellectual in all of American history' for good reason... Not only was he the President of Princeton and an incredible theologian but he was an intensely Bible centered preacher who God used with great might to start the first Great awakening in America.Great theology, matched with great pastoral purpose." Jonathan Edward's History of Redemption is "a massive theological treatise in the form of history," notes Christian History magazine (Vol. 4, No. 4, p. 6). Furthermore, regarding Edwards' work on this book, Christian History magazine states, "To prepare himself for the task, he read every historical work he could lay his hands on. He planned to trace the workings of God from Creation to his own day." In The History of Redemption Jonathan Edwards' chronicles God's mercy and faithfulness to His Church and the destruction of His enemies. This is a most remarkable glimpse into the mind of President Edwards. He boldly proclaims the glorious future of Christ's Kingdom on earth BEFORE the return of Christ. 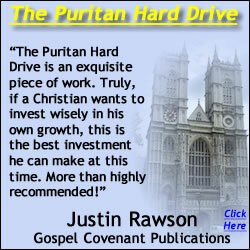 Jonathan Edwards Works are on the Puritan Hard Drive in PDF. 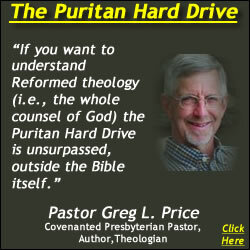 There are also 399 MP3s (audio books and sermons) by Jonathan Edwards on the Puritan Hard Drive, along with over 12,500 other Puritan and Reformation resources (books, MP3s & videos), world-class Reformed research & study software and a massive embedded database. WOULD YOU LIKE TO BE USED OF GOD TO PROMOTE BIBLICAL REFORMATION IN OUR DAY - AND TO FUTURE GENERATIONS? Would you like to volunteer some of your time to read classic Puritan and Reformed books and sermons to MP3, to make permanent digital audio versions of the best Puritan and Reformed books for our generation and for posterity? If so, we then list the Puritan and Reformed MP3s you have read on the Web, to give them away for free to people in every nation of the world - and, by God's grace, we reach between 45,000 to over 100,000 people each month with these free Puritan and Reformation MP3s! You may listen to other readings, by people just like yourself (who love the Lord and want to reach others with the love of the Lord Jesus Christ and the truth of His holy Word, the Bible) at FREE PURITAN & REFORMATION MP3 AUDIO SERMONS/BOOKS and from our "Audio Book" section on SWRB's sermonaudio site. 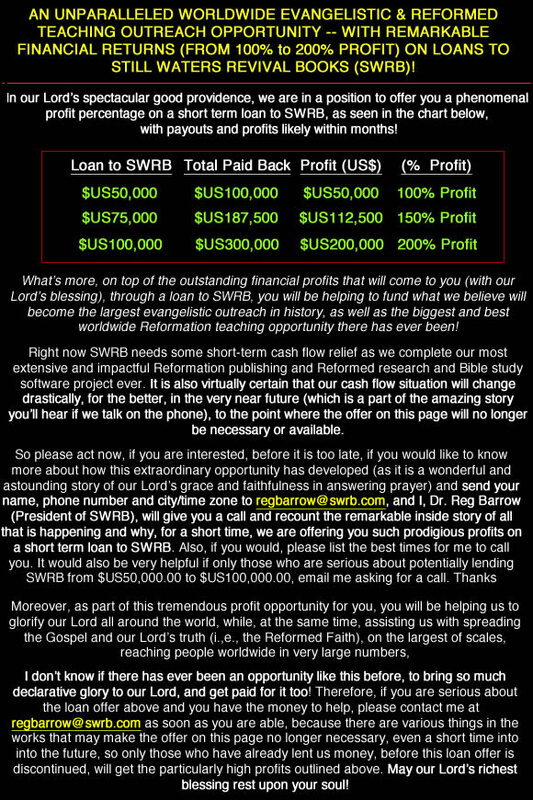 You may also use the FREE SWRB iPHONE, iPAD, iPOD (Touch) APP to listen. It is very easy to get started with your new international Reformation reading ministry, just email us at swrb@swrb.com requesting our "PURITAN and REFORMED BOOK READER INSTRUCTIONS." It may also be of interest to you to know that at SWRB we strive to use as much of the proceeds from sales, as is possible, to produce more free and discounted Puritan books, Reformation MP3s and Calvinistic videos. This is how, by God's grace, we have published so many books, MP3s and videos over the years (with a relatively small staff and the help of volunteers) and why we are able to distribute so much material for free and at such low prices - may our Lord get all the glory! With your continued prayers, support and purchases we will be able to reach even more people, in the future, all around the world with the truth of the Scriptures - using the latest and best technologies available, in the service of the Lord, to greatly multiply all the good that can be done, and aiming to fill the world with the best Christian (Puritan and Reformation) resources available (Acts 17:6). Thank you! 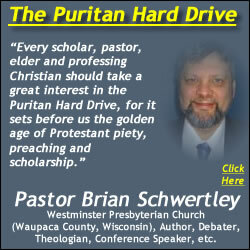 "In the history of the church's sanctification I don't believe there has been a more valuable extra-biblical resource and tool than the Puritan Hard Drive... It holds some of the most priceless Reformed works of God-centered and Christ-glorifying truth that were ever penned." - Dr. Matthew McMahon, A Puritan's Mind.